Kato Kiyoshi, the thinking head behind Kato Seisakushô pens, died in January of 2010. This company was Kato’s last endeavor after a life of turning pens here and there, in Europe and in the Middle East. His legacy passed onto Mr. Onishi, a former worker in Kato Seisakushô company. Onishi and Kato share a taste for anonymity and for celluloid. The lack of external markings and the irregular distributions of these pens –both Onishi’s and Kato’s— pose a number of problems on the side of the buyer. And that is what happened to me when I saw the pen I am presenting today: How many Kato’s pens remain unsold? How do we distinguish them from those made by Onishi? Is there, in fact, any real difference between them? Today’s pen –I was assured by knowledgeable sources— belongs to the last series produced by Kato Kiyoshi and, therefore, dates back from 2009. 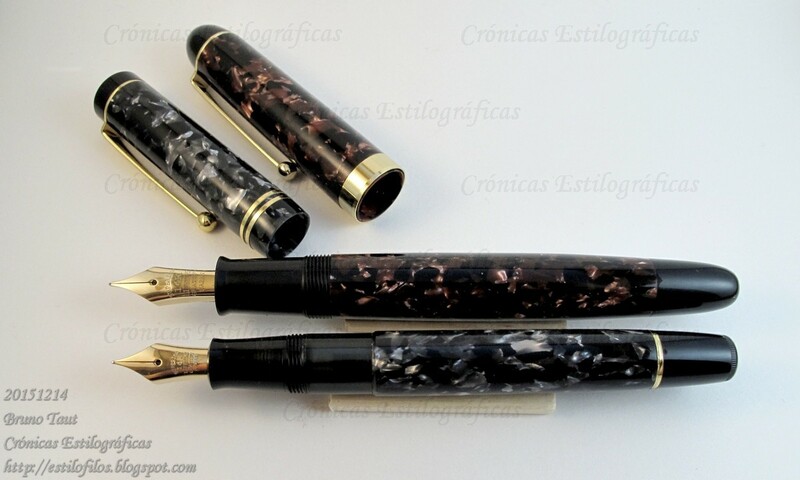 In fact, the size and the shape match the records of the model 2000 of Kato’s pens. This model 2000 is a cartridge-converter pen, and it implements a 14 k gold nib. As in the case of the model 800F, already described on these Chronicles, the nib inscription is very non-descriptive: “SUPERIOR / 14 K / LIFETIME / GRATIFY / JAPAN”. However, the size and dimensions of this nib are the same as those of the big size nibs made by Sailor, which is not surprising by now. But contrary to the usual Sailor policy, these nibs implemented by Mr. Kato are not engraved with any dating code. Nibs and feeds of the Kato's model 2000 (left) and of a big size Sailor nib (right). Two Kato Seisakushô's models: 800F and 2000. 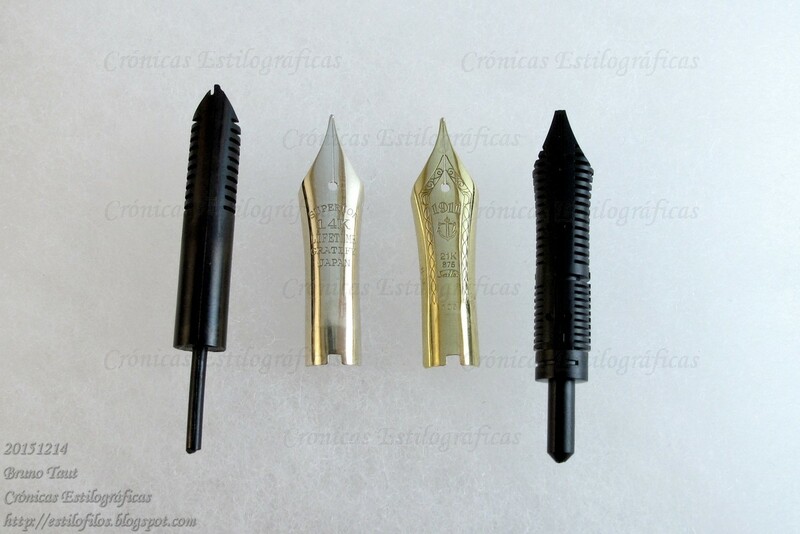 Note the differences in the nib size. The celluloid of this pen deserves some additional note. Traditional celluloid was a family of compounds of cellulose nitrate and camphor (plus dyes and some other agents). Modern celluloids were developed later and substituted the former in some applications, film stock to name just one, due to the instability and flammability of the old compound. 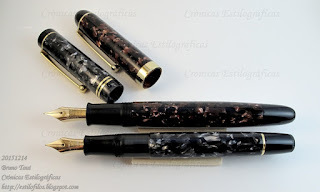 However, some high end pens, particularly by Italian makers, still use some variations of the classical formulation. And this seems to be the case of this Kato Seisakushô’s pen: it has a very distinctive camphor smell, very noticeable inside the cap and inside the barrel. (Note on Oct 2017: I had included a reference to a video published on YouTube by user VirtuThe3rdTV where both Mr. Kato and Mr. Onishi could be seen making pens on the lathe. The whole channel by VirtuThe3rdTV has been eliminated and the videos are not available). My thanks to Mr. Sunami.